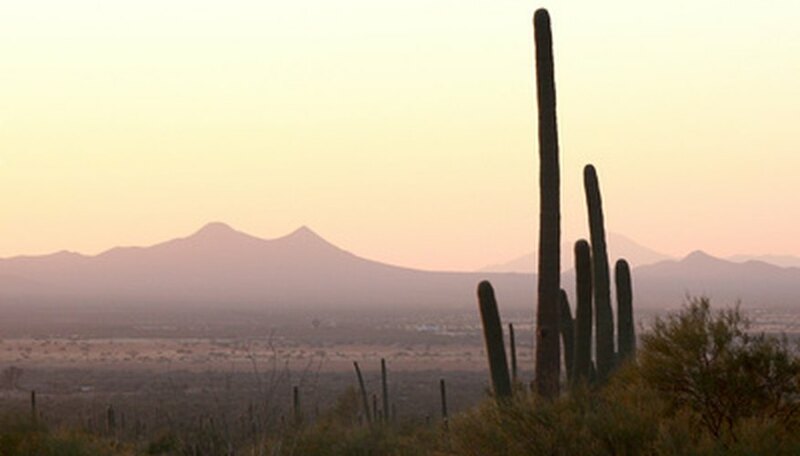 Tucson, Arizona, is in the low desert area with a climate similar to Phoenix, with slightly cooler summers and winters. Frost is more common in Tucson than in Phoenix. The average date of first frost is mid-November and the last frost is in mid-March. That doesn't mean the weather is freezing between those dates. Most nights are frost-free, with lows above 40 degrees Fahrenheit. Start the vegetable garden in late September or early October for harvesting through the winter. Place the bed where it receives at least eight hours of sunlight a day. Winter vegetables don't require warm temperatures like summer vegetables, but they do require sunshine. Some leafy winter veggies will grow in partial shade, but more slowly than they would in full sun. Peas need lots of sun to produce a crop. Dig the soil to a depth of 24 inches, using a shovel. Add a 3-inch layer of gypsum to counteract the alkaline Tucson soil. Adding compost, organic material and other soil amendments is a good idea as well. The low humidity in Tucson prevents plant material from decomposing quickly and adding nutrients to the soil. Remove any rocks and use them as a border around the bed. Dig a trench for English and snap peas that is 6 inches deep and 2 inches wide. Fill with 3 inches of compost and an inch of soil. Plant the peas 3 inches apart and cover with 1 inch of dirt. The peas should sprout in two weeks. Insert 5-foot stakes into the ground 5 feet apart and string with netting for the peas to grab with their tendrils and use as support. Spread leaf lettuce seeds over a 3-feet square area. Cover with 1/4 inch of soil and press lightly. Speed germination by covering the area with a black garbage bag to trap heat and moisture. Remove the plastic as soon as the seeds germinate. Plant leafy greens such as spinach, chard and kale in the same manner. Water frequently. It does rain in Tucson in November, December and January, but not enough to keep veggies growing. Once a month, water the winter vegetable garden deeply to get rid of accumulated salts from the alkaline water. Protect vegetables from a heavy frost by covering with sheets or straw. Cut off the tops of plastic water bottles and use to cover small seedlings. Cut off the top of gallon-size containers for milk or water and use to protect larger plants.